meant a commitment to not going to Vassar without enough taffy! to the interaction community and the configurations of interaction that would emerge. Considerable flexibility had to be involved. of a concert of active taffy streams, strands, ribbons. what the Vassar Community would offer me was just as, possibly more, significant. Acknowledgment of that significance meant that prepared portions of the Bishop Lecture had to interact with place, space, environment; had to be responsive to what would host it, had to interact with possibilities, configurations of host that had the power to reconfigure the lecture. Presenting the same material in the same way in different spaces and environments is something that does not tend to occur in a Limited Fork influenced configuration; such a gesture falls through tines, does not manage to adhere. How presumptuous to assume that an offering is so well-formed it need not yield, need not bend, need not place itself anywhere but above its hosts, its collaborators. 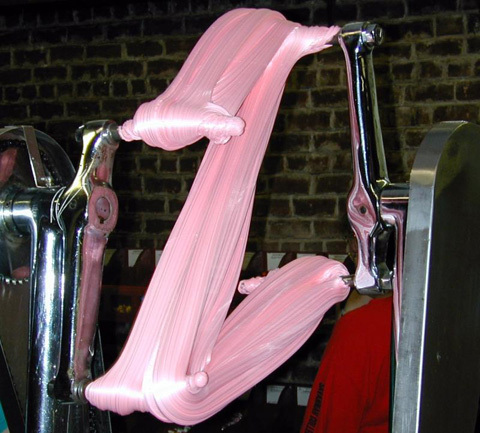 (The taffy-pulling image comes from the website of Robert Oppelt, double bassist, in the section A Taste for Rubato). My investigation of the interaction led me to Mid-Hudson Bridge Music by Joseph Bertolozzi, a first and fatal (for I have not yet managed to extricate myself —I'm totally taffy-deep, taffy-buried—) taste of Mid-Hudson Taffy. Bertolozzi played the Mid-Hudson Bridge. The Mid-Hudson Bridge became the percussion instrument it could become; Bertolozzi activated a possible configuration (had it been impossible, it would not have been activated). I joined the bridge, making dozens of sonic crossings, each one slower until an atmosphere of interaction emerged that was a bridge that surrounded the Mid-Hudson Bridge the way atmosphere hugs the earth in a thin ring that could be, when configured that way, layers of orb webs seen from their edge that is a shrunken configuration of an edge-on view of a spiral galaxy. I made more sonic tines, laid more tracks, more suspension cables with the iPhone application Bloom, recording each track into the computer as I built with collaborators a foundation for the lecture installation, a bridge to the lecture that all there could cross. I played the playing of the bridge. by Joseph Bertolozzi and 4kergirl (Thylias Moss). 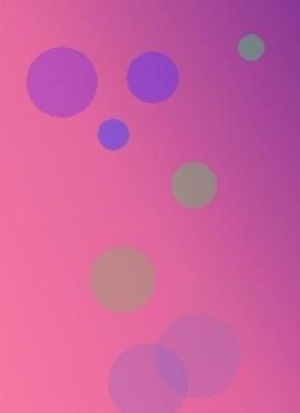 The above image is a screenshot of Bloom's iPhone user environment, showing the circles of sound that appear where the landscape is touched; a top-down view of a tops of sound forming a sonic canopy. Make practice sonic taffy with this app Bloom, or just listen to some of Bloom's ambient configuration possibilities right on the computer, though I don't think I would have composed the tracks with Bloom had my option been only mouse or trackpad control, as the intimacy of touch was important; direct interaction with the Bridge Music slowed, stretched to expose ambient potential as it entered the ears, tactile elements of hearing sound and of sound production. It became important not to use Bridge Languages (reconfigured as Mid-Hudson Taffy Company [exquisite foundry condition converging points of departure mix] in the experimental sound sculptures 10-disc box set) only as a translator of the visual system to be projected at the lecture. A root sonic system and a prepared visual system would interact in the space and environment, each shaping the other, influencing and configuring architecture of perception of those in the space, sound and visual occasionally parallel, occasionally touching, crisscrossing, etc. So Bridge Languages resisted becoming a soundtrack. At times, rivers of sights and rivers of sound flowed into each other, mingled; at times the flowing tines braided, unbraided after exchanging something in the interaction. Each imparted functional rhythmic components to the other while remaining a statement that could be made separately without there absence of the other seeming to create gaps without bridges. A visual experience was sufficiently rich to not require sonic presence or an ability to hear to interpret the visuals; the visuals spoke a visual language that became another language when spoken concurrently with a sonic vocabulary. The deaf or hearing impaired could have the visual sense of vibration that is not always audible to humans without amplification beyond the range of human audibility. A sonic experience was sufficiently rich to not require visual presence or an ability to see to interpret the sound; sound was not linked to visual behavior of image except for perceptual configuration of the interaction, interpretation of the conversation that unfolds when the sounds and visuals occur together. The blind or visually impaired could have a sonic experience sufficiently rich to not require visual installation components or an ability to see in order to interpret the sound whose purpose was not to advance or anticipate visual behavior. Neither a sonic illustration of visual elements nor a visual illustration of sonic elements engaging in an audio-visual conversation. Prepared sound and prepared visuals did not meet until the Bishop Lecture Installation. What prepared sound and prepared visuals said in the event was said as introduction to each other, to the physical and acoustic spaces, to the atmosphere, to the audience (who would become co-authors). Sound and visuals were amplified and projected separately in the spaces, the interaction occurring in concurrent yet unsynchronized playback. It was a, well, blind date between prepared sounds and prepared visuals; there was hope that there would be some attraction, some chemistry, some reason to sustain a temporary relationship, maybe even as an outcome of this one night (one lecture) stand, the birth of offspring and siblings of the interaction. There was not, however, any way to predict the outcome. Much depended on the participation and coauthoring of what convened in that auditorium, variables beyond my control just as the content I brought with me contained variables beyond the control of those would became coauthors even though they may not have entered the space as coauthors or had any intention at all of having to become coauthors when deciding to attend a lecture.